He rolled highest and opted to let me deploy first. 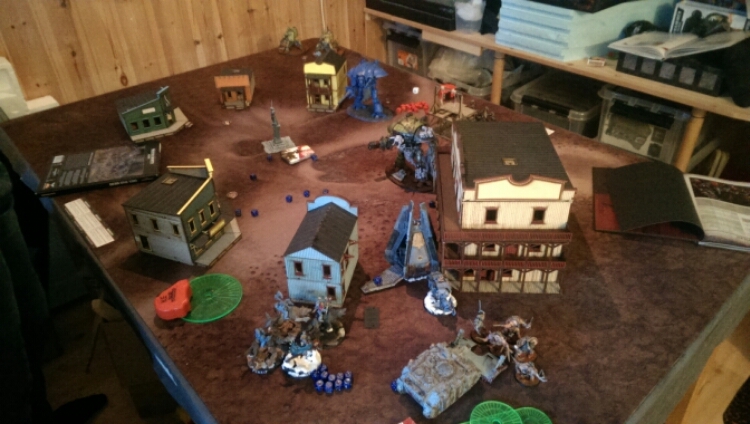 Then the bugger seized on me..
Hallvard went straight for it deploying his dread to block my sicarians advance. His thunderwolves advance up on the same side. 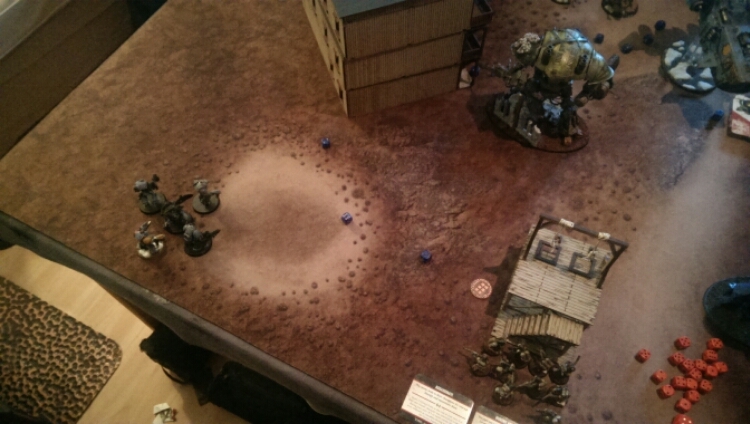 In the shooting phase the Long Fangs fire at the Paladin but doesn’t inflict anything. My turn. My sicarians target the vindi. Vanguard moved into the building. Errant moves forward. 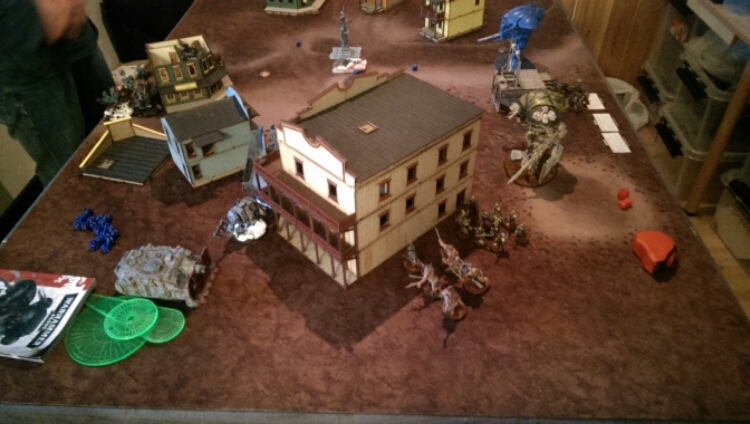 Onagers took out the Long Fangs for first blood. Vanguard took 1 hp off the pod. The rest missed. 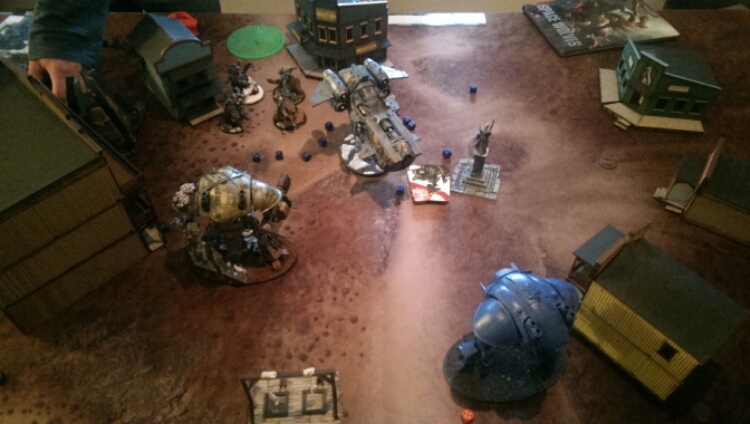 Sicarians assault and glanced the vindi to a wreck. I get 1 vp for assault and d3 = 3 for having control over twice as many as Hallvard. Dread flames my sicarians killing 1. Pod misses. 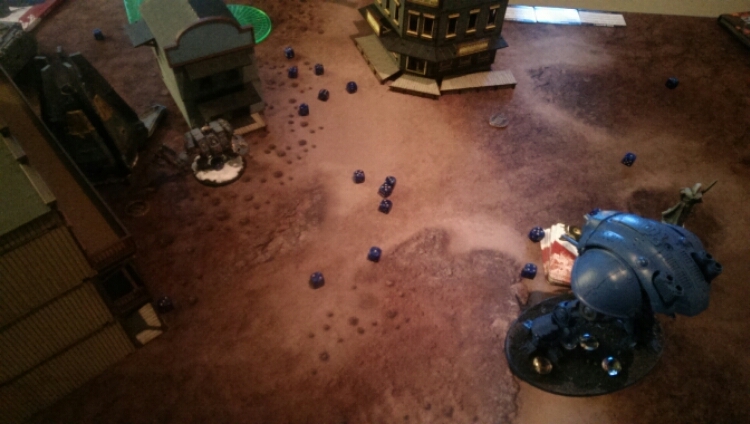 Termies target rangers killing 4, I hold. 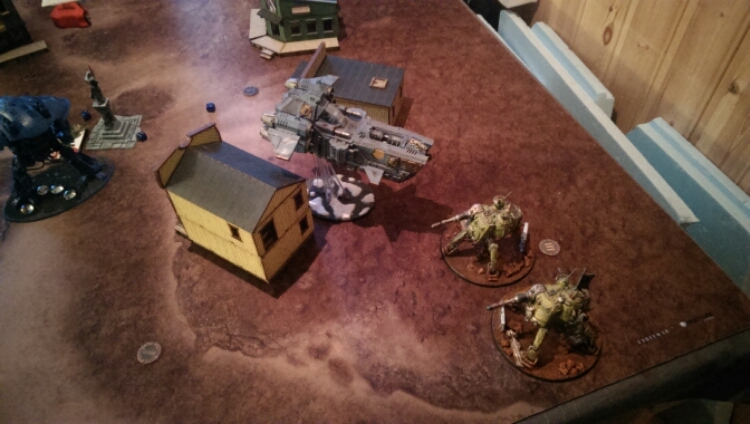 The flyer target the Paladin taking 4 hull points. Errant goes for the warlord, Paladin moved into the center in case of an explosion. Onagers moved into range of the termies. 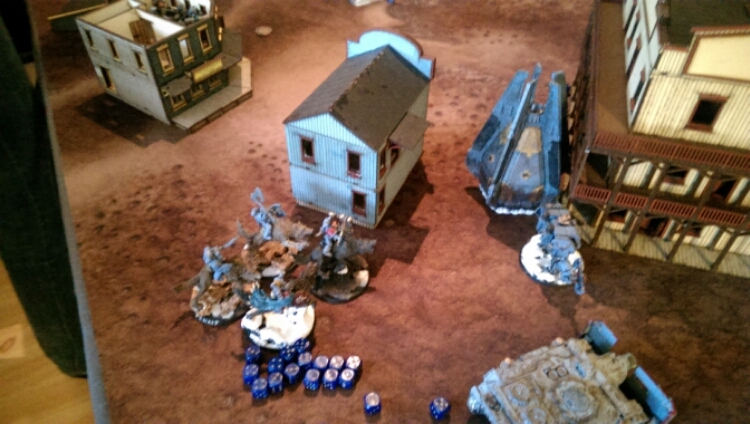 Rangers back on objective 6. Sicarian runs off. Onagers killed all of the termies. WOW! Paladin takes the pod. 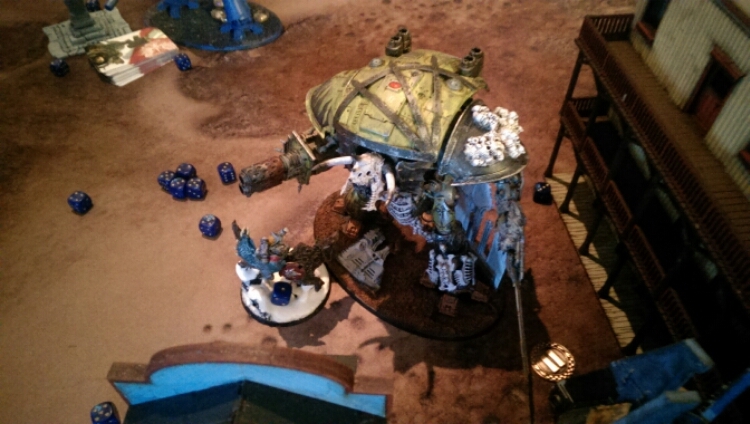 Vanguard take 1 hp off the dread. Errant charge the warlord. Inflict only one wound. Take 2 hp in return. Drats.. I managed to survive the onslaught only losing 1 hp. The dread then join the combat with the errant. Errant doesn’t do much, gets killed and explodes killing the warlord though the dread survive. I get slay the warlord. My turn. Onagers moved in range of the dread. I boosted BS +2. 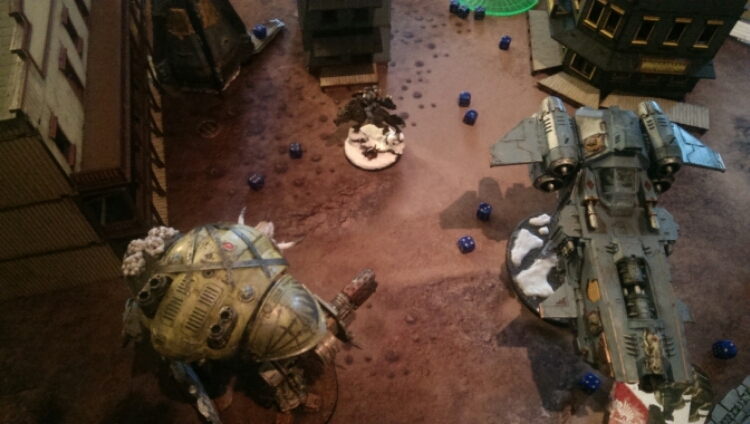 Vanguard use the plasma calivers and glanced the dread to death. Rangers fired at the flyer with the arc rifle, glancing twice despite jink. Haywire is AWESOME! I get a vp for dead character. Hallvard only has the flyer with 1 hp left so called it there. What. A. Brutal. Match! This game couldn’t have gone better. I really stomped him and I wouldn’t have done anything different basically. Next game I’ll test out a full admech list with Cult Mechanicus units as well.